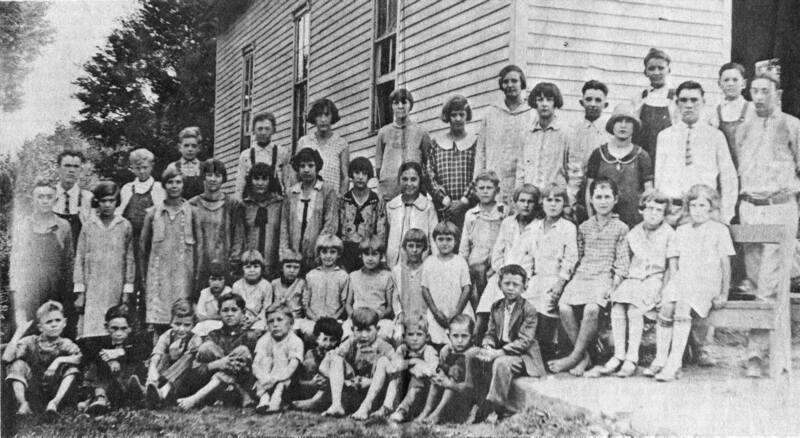 This photo of the POPLAR GROVE SCHOOL was taken in 1926. This school was located on the same side of Falling Water River about a mile north of Alfred Bartlett's farm under the present site of I40. Back row: Charlie Buckner (deceased), Floyd Smith (deceased), J.	T. Officer, Modeli Buckner, teachers Eunice Gragg and Lydia Wheat (both deceased), Gladys Smith Dietz (deceased), Mattle Jewel Hyder Jones, Value Bohannon Hyder, Frank Walker (deceased), Mary Madewell Jones, Willie Rye Hyder (deceased), Vestel Buckner, Herbert Randolph (deceased) and Oscar Buckner (deceased). This picture of the Browns Mill School was taken about 1895. This school was located just north of Highway 70 and east of Falling Water River, about a mile south of Alfred Bartlett's farm. It was the third building to house the Caney Fork Church. 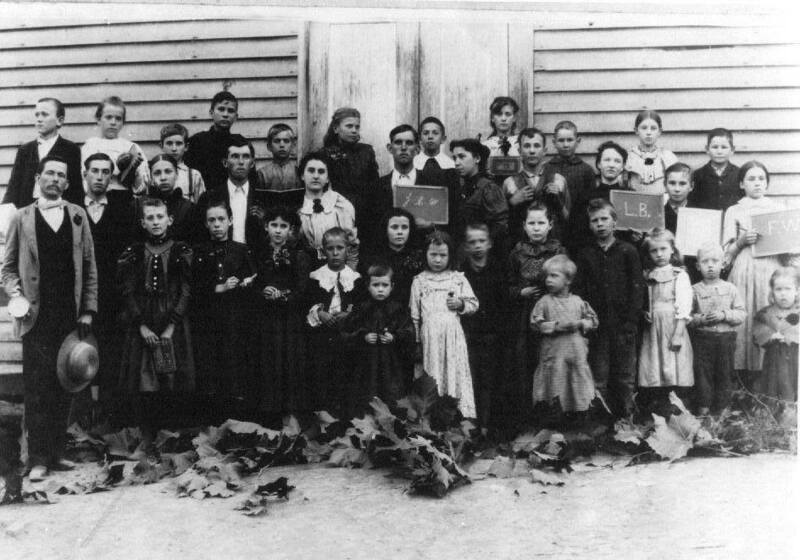 Front row: Beginning with the girl holding the book, the eighth person is Fred Henry. Beside him is Lou Mansell, Mayme Farley, Pansy Watson. The fourteenth person on the end is Ann Watson. Second row: Beginning with the man holding the hat, the second person is Alfred Bartlett, fourth is Ab Walker, sixth is John C. Watson, ninth is Lou Bohannon, and eleventh on the end is Florence Watson. Third row: Bob clouse, Willie Mae Watson, fifth is John Randolph Watson, sixth is Callie Dowell (facing her left), seventh Alvin Walker (wearing large white collar), and the boys ninth and eleventh are believed to be mansells.